Pink Ness was first introduced at the University of Liverpool, Botanical Gardens at Ness, hence its name. This tree has an attractive broadly pyramidal shape. 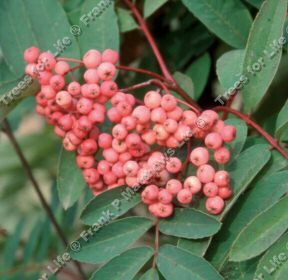 It is a mountain ash tree with glaucous grey-green leaves and unusual small mauvepink fruit. This tree is supplied at a height of between 1.50 and 2.00 metres and supplied in a 7-12 litre container for year round planting and better results than from either bare-root or rootballed stock. Nobody has actually written in and confirmed in writing that they thought our Sorbus Pink Ness was a tree of excellent value for money, with perfect customer care and that their life has been positively changed for the better however the imaginary psychic we consulted confirmed they did indeed think this.